Dim the lights and raise the curtain on a romantic wedding spectacular! Set the scene with sparkling gold details, pink ruffles and feathers and a dash of dramatic black. Credits: A cute ribbon wand will keep the children happy and make cute favours, $9.5o from A Girl and Her Needle. 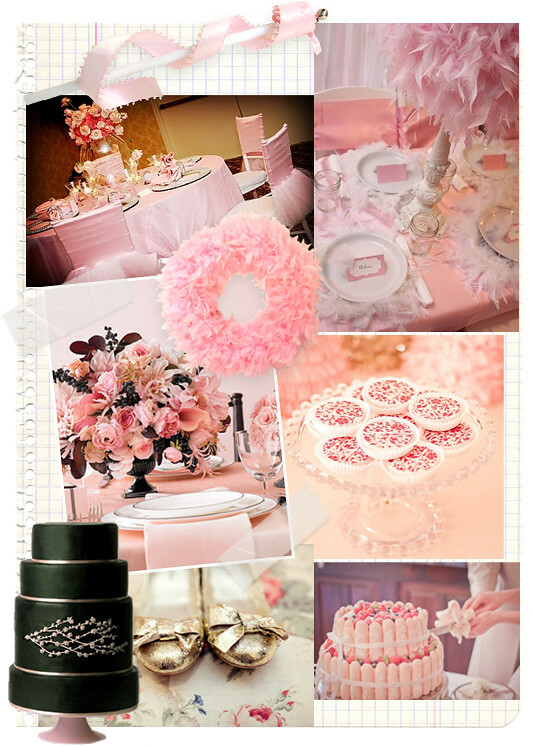 Go all out girly pink with a scattering of candles and even tutu wearing chairs! From Wildflower Linens via Circle City Planners. Add some feathered fun with a pretty pink wreath $40 from Thoughts of Home, or feathered table centrepieces by Fantasy Celebrations. Using black with the soft romantic pinks and creams is a great contrast and adds a little more drama to the decor, pic from Martha Stewart. Ballet shoes and pumps make pretty decorations and photo props, pic via Style Me Pretty.